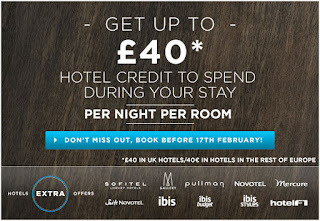 After their private sale promotion, AccorHotels steps up with this new offer: up to 40£ (or 40€ depending on the location of the hotel). We wrote 20€ in the title because this is the daily credit offered at the Mercure and Novotel properties, where most of us usually stay. The 40€ daily allowance is valid only at the more expensive Sofitel, Pullman and MGallery hotels. For all these 5 chains of hotels, the credit may only be used to pay off hotels extras, such as bar, restaurant, room service, room upgrade, movies, Wi-Fi expenses. For the Ibis and Ibis Styles the daily discount is 15€ and may also be used against paying for the room rate (translating thus in an effective 15€ on accommodation). For the Ibis Budget and Hotel F1, the daily credit is only 5€ and is automatically deducted from the room rates (in France the allowance is 10€ for the Ibis Budge hotels). The offer is valid for booking between 28 January and 17 February 2013 (except the UK, where the booking window starts on 4 February 2013). - from 1 March to 14 April for hotels in the UK.